Remember the sell off of Ireland's fishing rights back when we entered the EEC back in the 1970s? This week saw the application by the ESB to install 150MW of wave power devices off the west coast of Ireland. This is to be an important part of the Government's plan to have 500MW of wave power up and running in the not too distant future. This may sound like a lot, but compared with the total amount of wave energy hitting the west coast on a daily basis it's literally a drop in the ocean of free sustainable energy that is accessible on our shores. 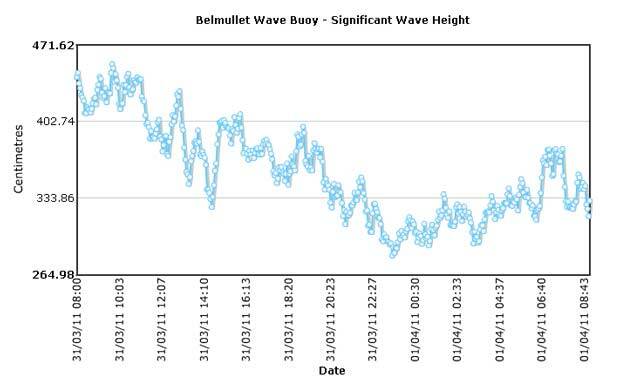 Ireland's wave potential is the highest in Europe - typically 70kw/m generating megatt-hours per annum per metre. The Marine Institute website discusses the Belmullet and Galway Bay wave energy test sites: "The Marine Institute, in association with Sustainable Energy Authority Ireland, established an Ocean Energy Test Site for scaled prototypes of wave energy devices in Galway Bay. The Department of Communications, Marine and Natural Resources issued a foreshore lease for the site in March 2006. The Test Site is situated on the North side of Galway Bay, 1 mile East of Spiddal. To avoid conflict with shipping, it is marked by navigation markers on four corners. The site is 37 Hectares in area and is in 21-24 metres of water." Wave heights for the few days up to 1st April 2011. You can check out the wave height on a continuous basis on the Marine Institutes website. The EU Commission has been looking enviously at the results from the Belmullet site in particular. The potential is couched not in kilowatt-hours or even megawatt-hours but terawatt-hours - enough to power half of Europe. Each meter of wave can produce 70+ kW/m typical energy - i.e. 70 units of electricity every hour per metre - at home this would cost you 13 to 16 cents per unit - say a tenner an hour per metre or over 80 grand per year for just one metre of wave crest. How many metres do we have and what's it worth? 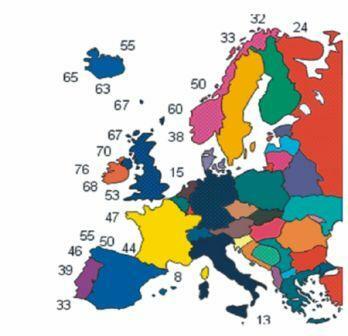 We have thousands of kilometres of coastline and just 100 km could produce 80 billion per annum say - a nice round figure that the EU have lent us at significant interest rates. That's potentially 80 billion worth per annum for just 100km - a barrage of 100km in 60m of water so that the bottom doesn't affect the shape of the incoming waves - hardly the length of Mayo. Even at 10% efficiency in extracting this energy potential 10 years would pay it back no problem. There is a catch of course. We once had huge fish resources too but we gave them away to the Spanish and French trawlers. By the time we managed to finance and build big trawlers - factory ships of our own that could ply the rough north atlantic it was too late - all the big fish were gone and off they went to plunder the seas off west africa. As part of the bank bail out now it seems that the negotiations currently under way will mean that we have to hand over our wave energy resources to our munificent EU partners who are graciously lending us those billions at close to 6% per annum. Irish bonds otherwise have hit 10% after the bank stress test on 31 March 2011 - just yesterday. As oil prices rise wave energy is obviously going to be incredibly valuable - "It's like having a Saudi Arabia within the European Union," said Jean Claude Trichet when asked by reporters yesterday. The Lisbon Treaty of course means that it is ours", he grinned, "And when I say 'ours' - I do mean OURS," he laughed a manic laugh at this, clutching his sides - laughing way too much for a central banker who are not noted for their sense of humour. Now we were really worried, so we went looking for Pat Cox and Ole Rehn to see what the real story was. Could they confirm that Europe was going to put corporate tax on energy produced off Ireland's Mayo Coast? Pat Cox said "The plan is to start with Mayo and work their way down the coast taxing each county in turn. The take will be 90% tax on all energy produced from European waves off the Irish coast" he said. "We are all Europeans now" said Ole who was standing next to Pat Cox. Mr Cox nodded in agreement. "Angela insists on this as a trade off on the corporate tax rate - German wave power is not up to much - the Baltic is too calm." he said, obviously familiar with wave energy. "And she lost the election this week of course, because of her nuclear power flip-flop in Baden Wutenburg - nobody wants nuclear power now after Fukishima." WikiLeaks to Encourage Water Leaks?